On May 13th, a painting by Barnett Newman sold at Christie's for over 84 million dollars. If you follow art world news there is a good chance you already knew that. Spectacular, over-the-top, record-breaking art prices are regularly in the news now. Auctions are being "live-tweeted" lot by lot and as soon as the auctioneer's hammer falls the results are everywhere. In fact, auction results often dominate the news coverage of the "Art World." That is really too bad. After all, sale of works of art at auction are simply transactions. Prices don't tell us anything about the art or its original intention or meaning: they just remind us that works of art have become powerful financial instruments that are increasing favored by the ultra-wealthy. Honestly I would like to see stories about auction prices covered as financial news: a few graphs and charts would tell the story just fine. That way, art critics and bloggers could devote their time to reporting on some more fresh and compelling art world stories. Now that I have had my rant -- and hopefully I still have your attention -- I would like to tell you about what I consider a very real and moving Art World story. Dominic Quagliozzi is a 32 year old interdisciplinary artist, originally from Massachusetts, who earned his Masters in Fine Art from Cal State University LA and who now lives and works in Los Angeles. He lives with cystic fibrosis and often has to deal with medical procedures including intravenous infusions, blood tests and urine samples. His art -- including paintings, digital images and performances -- references his medical issues and his mortality. Now that his lung capacity is only 19% Dominic has been approved to receive a double lung transplant at Stanford University Medical Center. Here is there now, waiting. In mid-April, while at Stanford for medical business Dominic was given a special viewing of a painting he has always wanted to see "Orange Sweater," a 1955 oil painting by Elmer Bischoff. Dominic had wanted to see this painting for many years, but it had never been on view when he visited the San Francisco Museum of Modern Art, which owns the painting. SFMOMA's main building is now closed while major construction takes place, but Dominic's mother was able to contact some helpful staff members who arranged for Dominic to see the painting in an undisclosed location. 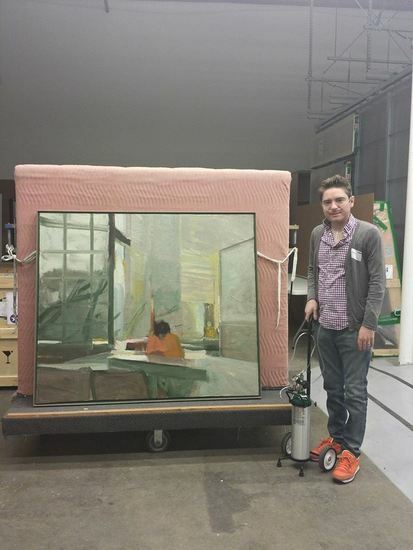 Dominic Quagliozzi with Elmer Bischoff's painting "Orange Sweater"
When I saw Orange Sweater in person, my eyes lit up. Reproductions had left the painting with an overall grey sensation, but my eyes saw passages of yellows and oranges and reds somehow dominating the canvas. As we looked at the painting and talked about it, the thing that kept being brought up was how much the painting changed with every look-away/look back. Bischoff really mastered something so lyrical and so visceral here, giving us new feelings with each eye movement. In the presence of Orange Sweater, I could be that kid again, gaining painting chops, seeing like an artist. I could be that kid with a future, strong and not worried about anything--the one without the terminal end of Cystic Fibrosis breathing down my neck. Now that is an art world story. It is about kindness, and about a work of art speaking to something deep, when deep really matters. Oh, and regarding tonight's Sotheby's auction? Expect some more high prices.